A GALWAY-BASED technology company has been named Best European StartUp at the a conference in Amsterdam. Pocket Anatomy beat off competition from 100 other companies from across Europe. The company was one of ten selected from the long list to pitch on stage inn front of over 2,500 web, technology and business leaders. 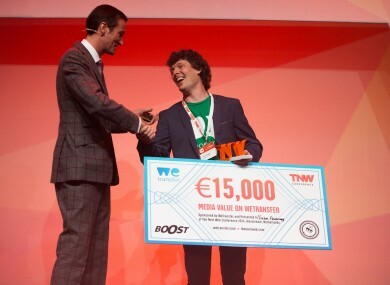 The award was presented at The Next Web conference, which is one of Europe’s top tech gatherings. It is the second bit of good news in recent days for Pocket Anatomy, which was recently selected as only the third European company to join the prestigious New York-based StartUp Health Academy. Pocket Anatomy bills itself as the Google Earth of the human body, allowing improved Doctor-Patient diagnoses communication. I am incredibly proud of what our team has achieved together, and look forward to working with more hospitals in Ireland, Europe and the US in contributing to more engaged patient understanding of their healthcare. Dr John Breslin, who is an advisor to Pocket Anatomy at its base in the NUIG Business Innovation Centre, said that local start-ups in Galway are already forming a “vibrant ecosystem”. Email “'Google Earth for the human body': start-up from NUIG wins European prize”. Feedback on “'Google Earth for the human body': start-up from NUIG wins European prize”.